The BBC with much fanfare has been publicising it's Great British Class Survey, which seeks to extend Britain's class structure from the three traditional classes of upper, middle and working class to now comprise 7 social classes of Elite, Established middle class, Technical middle class, New affluent workers, Traditional working class, Emergent service workers, and the Precariat. You can do the test here to find out what class the BBC rates you as, my own results planted me within the Established middle class, though personally I think a more accurate result would place me within the Technical middle class, the error is probably due to the fact I don't do social media such as facebook or twitter which impacted on the calculators results. 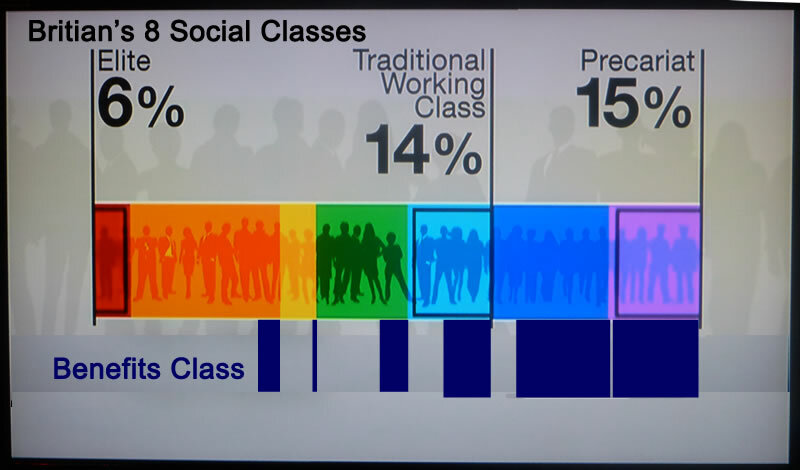 However there is a huge hole in the BBC's analysis and that is it excludes the 8 million of adults of working age who claim benefits of which at least 5 million are permanently on benefits and thus comprise the benefits class that amounts to 22% of those of working age in Britain, that would comprise near double the class referred to as the Precariat. Furthermore the benefits class social pecking order would be linked to the amount of benefits they are in receipt of and therefore the benefits class would tend to straddle the whole range from the Precariat right trough to the established middle class as illustrated by the recent case of Mick Philpott (found guilty of killing his children in a botched attempt to increase benefit payments) who was reportedly in receipt of £60,000 in benefits per annum which is an comparable income to those in the Established middle class. The breakdown of the benefits class is further complicated when those in receipt of tax credit benefits are taken into account, who tend to be perceived as the more deserving of benefit claimants. Note the above excludes pensioners. The above graph clearly shows that there exists a huge vested interest in the Benefits Culture, which is not something that has come about by accident but by Labour Party design as the last Labour government attempted to maximise vested interest voters that it was continually seeking to expand breadth of in an attempt to bribe the electorate into repeatedly voting for a Labour government, regardless of the inflationary consequences of spending money that the country does not have (printing debt). The benefits culture can be seen as a Labour party voting block that the Conservative party can only seek to defeat at the next election by fragmenting i.e. turning one part of the benefits culture against another part in which respect the Coalition is putting In-work Benefit recipients up against Non-working benefit recipients. The benefits culture is a disease that encourages laziness and jealousy of those who become successful through hard work, hence why those most vocal against successful immigrants tend to be lazy benefit claimants who have literally not done a days work in their lives and don't intend on doing so , but still spout the likes of the poles have taken our jobs! This despite the fact that it was LABOUR policy to import working class immigrants due to the fact that they would tend to vote LABOUR! 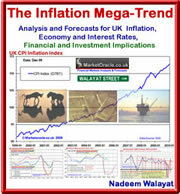 Unfortunately most voters are gullible and easily bribed so Labour will probably win the next general election as they will promise everyone everything under the sun, so the only thing hard working people can do is to prepare themselves for the coming inflation stealth theft of wealth that Labour election bribes will deliver. Many vested interests decry the Tories as being the nasty party but the really nasty party is Labour because they tell the poor they cannot do anything for themselves but instead must rely on free money and services to live on and all they want in exchange is their vote the consequences of which is that Britain continues to die a slow death.